This is probably the first time I could say that I’m actually current with regards to the gaming scene. 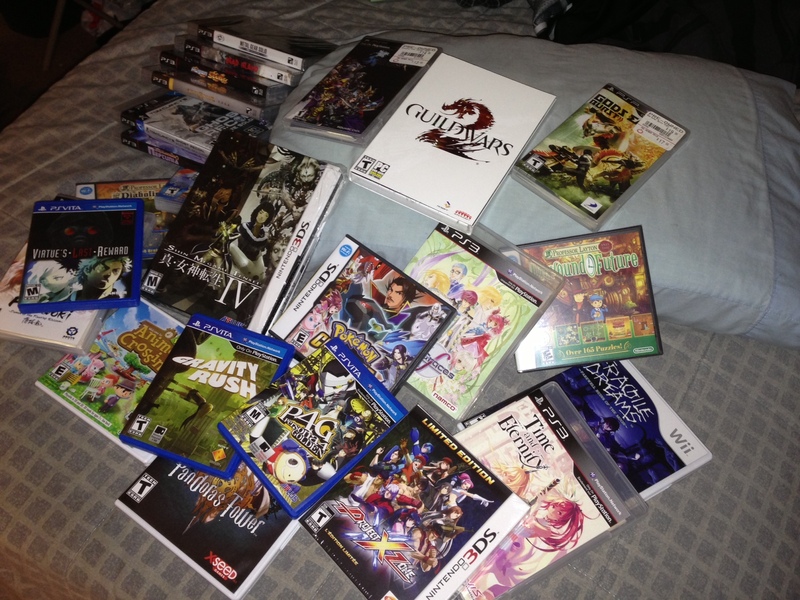 I own a 360, PS3, PSP, Vita, 3DS, 3DS LL (XL in JP), and a Wii. The only current generation console that I’m missing would be the Wii U, which I’ve been waiting to go on sale. I have quite a collection of titles in my gaming library. I don’t play as many genres as I used to, but out of the ones I do play, I’d say I’m relatively current. The latest additions to my library are Ni No Kuni, Fire Emblem, Project X Zone, Time and Eternity, and Shin Megami Tensei IV. I have Tales of Xillia and Rune Factory IV on pre-order and a few other titles which I’ve forgotten about. Author Mathew ArcillaPosted on March 4, 2012 Categories Anime, Gaming, Music3 Comments on AWOL… still?